And so the onslaught of Asian food continues. 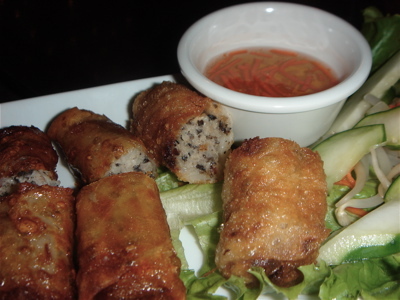 Tonight's edition - Vietnamese at Brooklyn Heights' new Kim Paris Vietnamese Grill. Accompanied by my adventurous pals Les and Phyllis, we entered the second floor restaurant with trepidation. The place was dark and empty - but then again it was Christmas eve at 7pm. Besides, the joint did look clean and there weren't many other options open on the block. We started in with a platter of crackling crisp Cha Gio (pictured above), fried spring rolls filled with shrimp, crabmeat, mushrooms, glass noodles and taro, served with tangy nouc nam sauce alongside. We made quick work of them, washing it all down with glasses of Vietnamese Iced Coffee, deep, dark and sweetened with rich condensed milk. Then the entrees arrived. That's when it went downhill. Our order of Ginger Honey Prawns was a sad jumble of shrimp, chunks of onion, bell pepper and shaved pickled ginger - the latter ingredient seemingly swiped from the sushi joint next door. Yick! A noodle dish called Banh Hoi wasn't much better - disappointing chicken bits on skewers, sitting atop a paltry portion of lukewarm angel hair. Only the Grilled Pork Chops marinated with lemongrass was worth eating, but even the chops didn't quite have the chops to inspire a return visit to Kim Paris. Needless to say, I'm thinking a trip tomorrow to Chinatown might be required. After all, it is a Judaic Christmas tradition!